Get a little Tax Day relief with these freebies and discounts at local businesses offered April 17th only. Chili’s Grill & Bar – Anyone 21 years old and older can get $5 Presidente Margaritas as part of Chili’s Tax Day promotion. 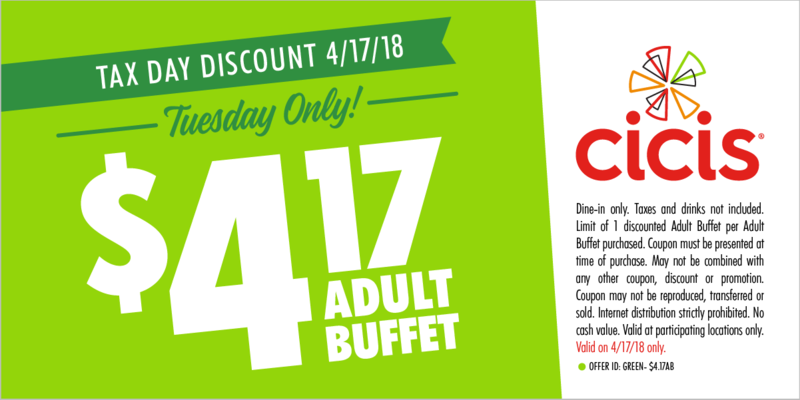 Cici’s Pizza – Cici’s Pizza is offering the all-you-can-eat buffet for $4.17 today. You’ll need this coupon to get the deal. 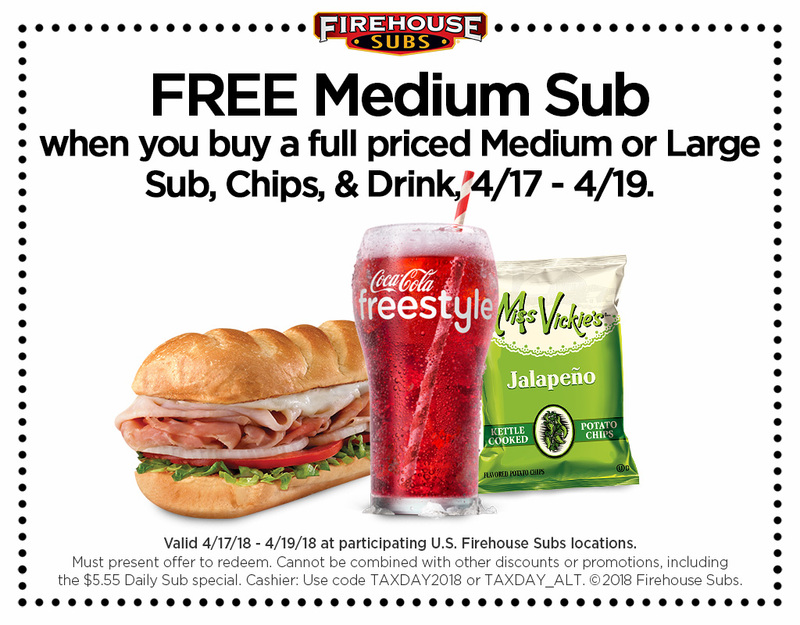 Firehouse Subs – Firehouse Subs is inviting guests to stop by to receive a free medium sub when they purchase a full price medium or large sub, chips and a drink (valid Tuesday, April 17 through Thursday, April 19, 2018). Please click here for a link to the offer. Great American Cookie Company – The Great American Cookie Company continues its annual Tax Day tradition by offering a free Cookies & Cream cookie to customers who stop by participating stores on April 17. Limit one per customer, while supplies last. Quiznos – Quiznos is offering a 10.40 percent deduction off any purchase including catering, on April 17 to new or existing Toasty Points loyalty app members at all participating U.S. locations. Schlotsky’s – Schlotzsky’s is offering a free small original sandwich with the purchase of chips and a medium drink. Sonic – Sonic is offering half-priced cheeseburgers all day Tuesday. We will continue to update this list as we find more freebies and discounts. Check back for more deals.